‘CELEBRITY chef and restaurateur Aldo Zilli will put finalists through their paces in the Scottish Italian Awards. Excitement is building around the second year of the contest, which has added extra categories, a bigger venue and the chance for winners to compete in a brand new UK-wide final. Aldo will judge the best pizza restaurant and best chef categories, putting the finalists in the latter through a “Hell’s Kitchen” scenario before announcing the winner. Mr Paul added: “Last year the chefs got to cook for the judges in their own surroundings – this time, we are taking them out of their comfort zones and asking them to recreate one of Aldo’s dishes in front of him at the Cook School in Ayrshire. The success of the Scottish Italian Awards – a capacity audience of 630 people attended last year’s final – has prompted organisers to branch out further afield. The first ever English Italian Awards will be launched in Manchester next spring. 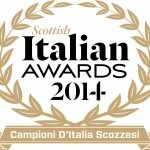 Keep up to date with the happenings of the Scottish Italian Awards by liking us on Facebook and following us on Twitter.